A Biofarm school was established in the grounds of the "Sebeta School for the Blind and Disabled", in cooperation with the "Development Organisation for People with Disability" (DOPD). Visually impaired students and teachers are trained in integrated organic farming methods and can immediately apply the knowledge they have gained to the Sebeta school farm. The Sebeta Biofarm acts as a training and model farm not only for the farms around but also nation-wide for people with disabilities living in rural areas. Participants receive materials and technical guidance which enables them to apply their new knowledge to their own desert farm and to pass it onto their neighbours. In the current phase of the project, the school is being prepared to continue these activities independently. Food produced on the biofarm is used in the school kitchen and any surplus is sold at the local market. Sales in the market generate additional income for the disadvantaged people. Alongside practical work and theoretical knowledge of organicfarming, course participants are also given classes in life skills. Important topics include HIV/Aids, family planning and awareness building to prevent sexual exploitation of disabled women. The integrated approach of the organic farm school opens up new opportunities for disadvantaged people with disabilities and impoverished small-scale farmers. 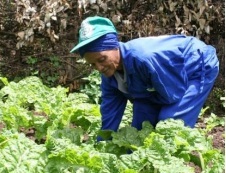 Training in ecological agriculture helps people to increase their food security and thus their livelihoods. The chance to improve their economic situation is a first decisive step towards their integration into society. To contribute to the sustainable development of the Sebeta District through the use of ecological farming methods, and also to the well-being of marginalised people. Five years after establishing the biofarm school 50 farmers of both sexes are being trained as experts in organic agriculture, and they in turn are teaching 1500 impoverished small-scale farmers about sustainable farming methods. Inaddition, 250 disabled students benefit from the activities of theorganic farm.